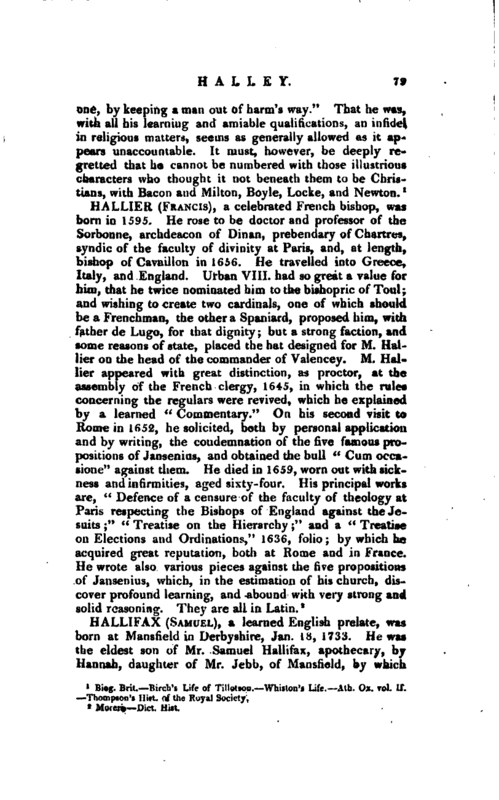 , a learned English prelate, was born at Mansfield in Derbyshire, Jan. 18, 1733. He was the eldest son of Mr. Samuel Hallifax, apothecary, by Hannah, daughter of Mr. Jebb, of Mansfield, by which | alliance our author became first cousin of the late sir Richard, and Dr. John Jebb. 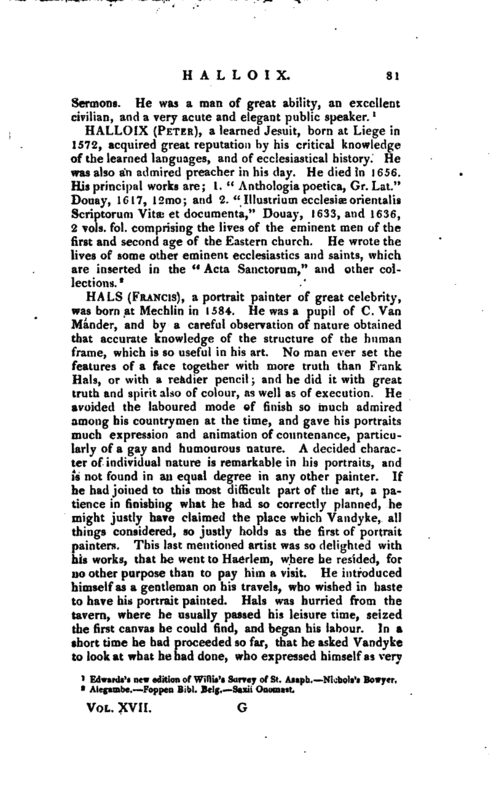 He was admitted of Jesus college, Cambridge, where he distinguished himself in his academical exercises, and he was in the list of wranglers, as they are called, and obtained the chancellor’s gold medal forclassical learning, and some prize dissertations. He proceeded A. B. in 1744, and A.M. in 1747, and afterwards removed to Trinity Hall (where are only two fellowships in divinity), and proceeded LL.D. in 1761. In Nov. 1765 he was presented to the rectory of Chaddington, in Buckinghamshire, and in 1768 was elected professor of Arabic in the university of Cambridge, which he resigned in 1770 on being made regius professor of civil law. In February 1774 he was appointed chaplain in ordinary to his majesty; in 1775 was created D. D. by royal mandate, and on the death of Dr. Topham succeeded him as master of the faculties in Doctors Commons. From Mrs. Galley, relict of Dr. Galley, prebendary of Gloucester, he received, without any solicitation on his part, but merely as a reward for his eminent services in the cause of religion, the valuable rectory of Warsop, in Nottinghamshire, in 1778. In 1781 he was advanced to the see of Gloucester, and thence was translated to the see of St. Asaph in 1787, being the first English bishop that was translated to that see, and the second that was translated to a bishopric in North Wales. He died of the stone, March 4, 1790, when only fifty-seven years of age. 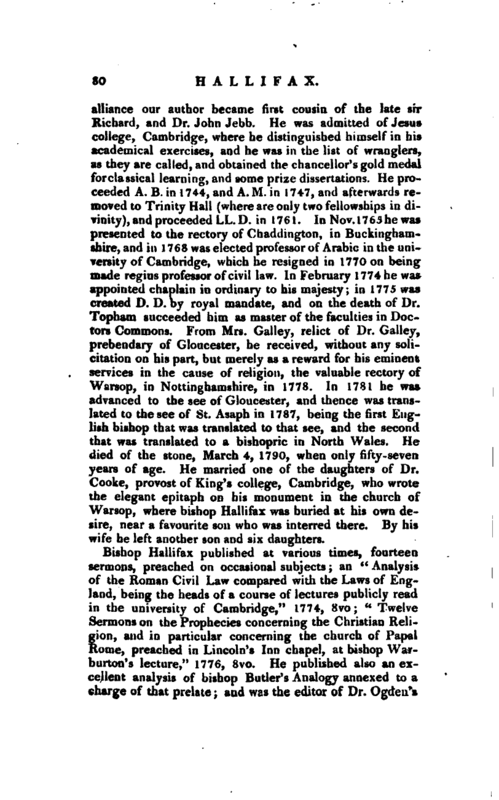 He married one of the daughters of Dr. Cooke, provost of King’s college, Cambridge, who wrote the elegant epitaph on his monument in the church of Warsop, where bishop Hallifax was buried at his own desire, near a favourite son who was interred there. By his wife he left another son and six daughters. Edwards’s new edition of Willis’s Survey of St. Asaph. Nichols’s Bowyer.